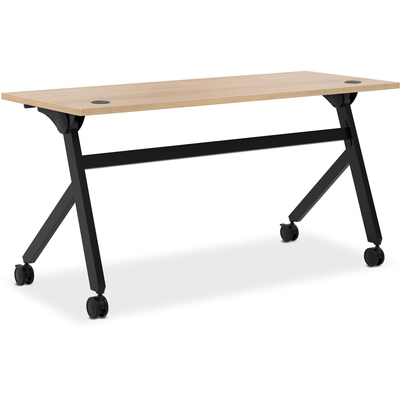 Flip base table is outstanding for collaborative areas. Worksurface tilts from work mode to nesting position on sturdy hinges that rotate smoothly. Tilt-lock mechanism is released by a convenient full-width handle. Durable steel chassis features two sturdy cross beams to keep the worksurface aligned and sturdy. Includes two locking and two non-locking casters for mobility. Unsurpassed flexibility and uncompromising quality at an unexpected price. Outstanding for collaborative areas. The worksurface tilts from work mode to nesting position on sturdy hinges that rotate smoothly. The tilt-lock mechanism is released by a convenient full-width handle. Durable steel chassis features two cross beams to keep the worksurface aligned and sturdy. Includes two locking and two non-locking casters for mobility.